Due to limited sales, Diesel Recovery (DRC) one-gallon bottles, five-gallon pails and 55-gallon drums are discontinued and available while supplies last. 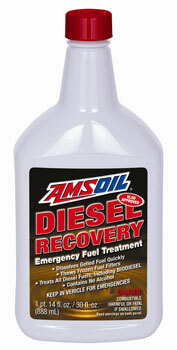 Diesel Recovery is still available in 30-ounce bottles. Discontinued package sizes are available at reduced prices and revised commissions. AMSOIL will not accept returns on these sale-priced, discontinued items. Diesel Recovery quickly and effectively dissolves the wax crystals that form when diesel fuel surpasses its cloud point. It liquefies gelled diesel fuel, thaws frozen fuel filters and reduces the need for a new filter, saving money and allowing the operator to continue driving with minimal downtime. Diesel Recovery performs well in all diesel fuels, including ULSD, off-road and biodiesel and is alcohol-free and non-corrosive. AMSOIL Dominator® Coolant Boost is designed to reduce corrosion and significantly enhance heat transfer in cooling systems. One of the overlooked benefits of better heat transfer is much quicker engine warm-up in winter conditions, which is noticed when the vehicle’s defroster works much sooner. To understand how Dominator Coolant Boost reduces engine warm-up times in cold weather, it is imperative to understand the fundamentals of an engine’s cooling system and how Coolant Boost’s proprietary tiered-surfactant technology works. The same tiered-surfactant technology that aids in reducing engine operating temperatures also decreases engine warm-up times. Graphic A illustrates how each surfactant in Coolant Boost’s tieredsurfactant technology is designed to provide optimal performance over a wide temperature range, while competing products with only one surfactant are limited to performance in a single temperature range. Filters for several popular Toyota applications. 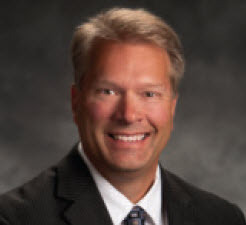 Modern engine design trends have resulted in some vehicles that present multiple challenges to filtration engineers, especially those who are focused on delivering extended service life. In order to remain serviceable for an extended period, a filter must ensure adequate capacity while maintaining sufficient efficiency throughout the specified interval. This is often accomplished in part through the use of high efficiency media and a slightly larger can to increase capacity. Vehicle manufacturers are under tremendous pressure to provide fuel efficient vehicles that produce fewer emissions than their predecessors. In fact, government mandates require automakers to meet specific fuel efficiency and emissions benchmarks or face steep monetary penalties. Vehicle original equipment manufacturers (OEMs) employ a variety of techniques to improve efficiency and reduce emissions, and nearly all of them negatively impact motor oil and oil filtration. To meet the demand for greater efficiency, OEMs are offering smaller, more aerodynamic cars. They have also introduced several new engine technologies designed to deliver greater power out of smaller, more fuel-efficient engines, which often rely on turbos or unique fuel injection systems that can increase the amount of contaminants introduced into the oil. As these cars have become smaller, engine compartments have become too tight to use a filter of increased size. This, coupled with the trend toward smaller oil sumps in many of these applications, results in an extremely challenging task for oil filters. To meet the demand for reduced emissions, OEMs are applying a number of methods, including exhaust gas recirculation (EGR). EGR works by recycling a small amount of spent exhaust gas back into the combustion chamber. Some of the side-effects of EGR include less-efficient combustion, increased temperatures and increased acids; all of which add to the oil filter’s workload. For some of these applications extending the service life of the oil filter would seem impossible. Smaller sump sizes, engines prone to sludge and smaller filter sizes, combined with increased contaminants in the engine oil, present a serious challenge to filtration engineers. 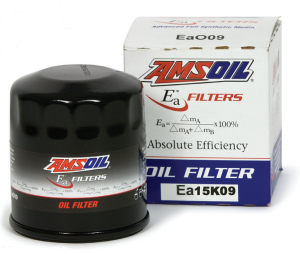 AMSOIL has overcome all those obstacles with its introduction of 15,000-mile Ea Oil Filters (EA15K). There are 11 15,000-mile Ea Filters in all, including some that were previously available as 25,000-mile filters. While AMSOIL has had no issues with these filters, the engine technologies used in the vehicles to which they apply are simply too demanding on an oil filter to continue offering 25,000-mile intervals. Also included in the group of 15,000- mile Ea Oil Filters are a number of filters (EA15K09, EA15K10, EA15K13) that were either discontinued or available only at OEM-recommended intervals due to the engine design issues outlined in AMSOIL Technical Service Bulletins FL-2009-05-01 and FL-2010-04-01 (click the Tech Service Bulletins link on the right side of the AMSOIL homepage). There has been a high demand for the reintroduction of these oil filters, and now annual oil and filter change intervals are once again possible for the corresponding applications. Ea Oil Filters recommended for 15,000- mile service intervals are designated by the product code EA15K. These filters have been redesigned, but still feature the same premium nanofiber synthetic media as their 25,000-mile counterparts. In addition to some slight packaging modifications, AMSOIL has identified existing Ea Oil Filters moving from 25,000- to 15,000-mile intervals by placing stickers on the boxes. Only a limited number of oils are proven effective in these applications. With the beginning of each new year, many people think about what they can do to improve some aspect of their lives. AMSOIL is no different, except that it’s an ongoing process. We are always looking for ways to improve our products, and one of the ways we validate products is through field studies. The AMSOIL technical team recently completed a field validation study outlining the performance of AMSOIL hp Injector Synthetic 2-Cycle Oil (HPI) in Evinrude® E-TECTM engines. These engines are unique in that they offer an alternative, lean-mix setting that allows the engine to use less oil. Whether programmed to run at the standard mix ratio or reprogrammed to the lean-mix setting, E-TEC engines use sophisticated electronic equipment to monitor conditions like RPM and throttle position to determine the gas-to-oil ratio injected into the engine – similar to how electronic oil life monitoring systems determine when a car’s oil should be changed. In order to take advantage of the lean-mix setting, a customer must have his or her engine reprogrammed by an Evinrude dealer. The customer must also agree to use Evinrude Johnson XD100TM two-cycle oil exclusively. Of course, we know that hp Injector is up to the task, and to prove it, AMSOIL conducted a study at a SEA-TOW facility featuring twin Evinrude 250 hp E-TEC engines, one lubricated with hp Injector and the other with Evinrude Johnson XD100. SEA-TOW is a marine-rescue organization specializing in non-emergency calls for assistance, typically towing large vessels like sport cruisers and yachts. This is an ideal environment for testing hp Injector in reprogrammed E-TEC engines under heavily loaded conditions. As part of the study, both engines were run for 28 hours on the standard oil injection setting and were then reprogrammed by an Evinrude dealer to operate at the reduced oil consumption setting for the duration of the study. The starboard engine’s oil reservoir was filled with AMSOIL hp Injector and the port side engine’s oil reservoir was filled with XD100 two-cycle oil. The validation period lasted a total of 534 hours; approximately 240 hours were spent under heavy-duty service conditions when the SEA-TOW boat towed marine vessels. The engines were closely monitored for the duration, and upon completion, both were disassembled and rated by a certified independent rater from Intertek. Intertek of San Antonio, Texas is an independent company specializing in product and performance testing, including qualifi cation testing of lubricants. Intertek evaluated both Evinrude engines based on NMMA TC-W3 criteria for two-cycle marine engines, examining the condition of all engine parts and inspecting for wear and deposit formation. Wear protection in critical areas, including the cylinder walls, was one of the main areas of interest. Although we expected hp Injector to perform well, the results exceeded our expectations. This photo shows one of the cylinders from the hp Injector-lubricated engine. Note that the original cross-hatch pattern is still visible. The scratch marks above the exhaust port are the result of a mechanical phenomenon; they appear in the exact same spot on the XD100-lubricated cylinders. As seen in the photo, the cylinders looked almost new and the cross-hatch pattern from machining is clearly evident. Blockage of the exhaust ports is rated on a 10-point merit scale; a rating of 10 indicates the port is 100 percent free of blockage. Scuffing of the cylinder walls is measured by percent, where 0 percent indicates no scuffing. Both hp Injector and XD100 received high ratings. The exhaust ports of both the AMSOIL- and Evinrude-lubricated cylinders had few deposits. Both oils scored near a perfect 10. Neither set of cylinder liners showed scuffing of the cylinder walls. 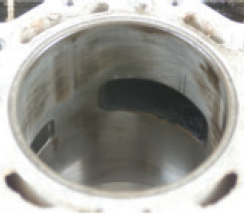 Both engines received a 0 percent wear rating in the cylinder wall area, indicating the oils provided statistically equivalent overall wear protection. AMSOIL hp Injector and XD100 earned near identical merit ratings for hard carbon deposits, scuffing and/or staining in all critical engine areas, including pistons, connecting rods, cylinder head, crankshaft and main bearings. The physical condition of these parts demonstrates that equipment integrity in both engines was maintained at near identical rates, despite the reduced oil rate and severe service conditions. The evidence clearly supports the use of AMSOIL hp Injector in E-TEC engines programmed for reduced oil consumption. Based on these findings, AMSOIL hp Injector will provide excellent protection for Evinrude E-TEC engines programmed for reduced oil consumption, and AMSOIL fully supports the use of AMSOIL hp Injector in place of Evinrude XD100 in these applications. In a recent real-world field study, AMSOIL Synthetic Polymeric Truck, Chassis and Equipment Grease (GPTR2) reduced grease consumption and demonstrated superior pound-out and washout resistance compared to a competing synthetic EP grease. The field study subjected both greases to identical operating and weather conditions in a 2003 front-loading Autocar Ignitor refuse hauler. During the 56-day study, the refuse hauler was placed into daily service unloading over 100 commercial dumpsters during a 12-hour shift. The vehicle routinely encountered adverse weather and extreme-pressure environments that can pound-out and washout inferior greases, causing corrosion and wear, which provided the ideal environment for testing greases. Synthetic Polymeric Truck, Chassis and Equipment Grease was installed in one side of the vehicle using a manual pistol- grip style 6,000 psi grease gun, while the competing grease was installed in the identical components on the opposite side. After operating the vehicle to ensure complete removal of the old grease, the refuse hauler underwent a series of three re-greasings throughout the field study. The number of pumps required to properly lubricate the 19 grease points on each side of the vehicle was recorded. A visual inspection of each grease point was also conducted to record abnormal conditions, including excessive grease consumption and the presence of water. The chart displays the number of grease gun pumps required to properly lubricate each side of the refuse hauler. 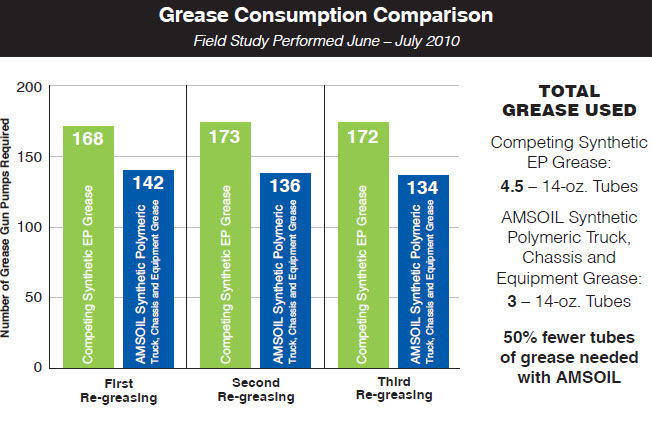 Results from all three re-greasings show reduced consumption using AMSOIL Synthetic Polymeric Truck, Chassis and Equipment Grease, with its extended service capabilities becoming more evident as the field study progressed. Overall, three 14-oz. cartridges of the AMSOIL product were required, while 4.5 14-oz. cartridges of the competing grease were required. Despite operating in identical conditions, the advanced chemistry of AMSOIL Synthetic Polymeric Grease allowed it to remain intact better, requiring less grease to provide increased protection. Throughout a 12-hour shift, the hoist, lift arms, king pins and other components responsible for raising heavily loaded dumpsters repeatedly encounter extreme pressures that can poundout inferior greases. Without grease in place acting as a seal, water and other contaminants can penetrate the area, causing corrosion and wear. In addition, metal-to-metal contact results, ultimately causing component failure. AMSOIL Synthetic Polymeric Truck, Chassis and Equipment Grease resisted pound-out to stay in place longer than the competing grease, forming an effective seal to repel water and other contaminants. In multiple instances, visual inspections found water between surfaces greased with the competing product. The side of the vehicle lubricated with AMSOIL, however, resisted washout due to the product’s superior adhesion and cohesion properties and did not allow water to enter greased areas. Test results achieved in real-world, severe-service operation demonstrate the superiority of AMSOIL Synthetic Polymeric Truck, Chassis and Equipment Grease. It remains intact for maximum protection and clings tenaciously to metal surfaces, helping keep water and other corrosive contaminants from penetrating greasable components. It can extend service intervals or require less grease when re-greasing, saving fleets money. Each fall, over 100,000 automotive specialty products industry leaders from more than 100 countries gather at the Specialty Equipment Market Association (SEMA) Show to showcase and demonstrate products, attend seminars and special events and take advantage of networking opportunities. Held November 2-5 at the Las Vegas Convention Center, the 2010 show boasted more attendees, booths, new product introductions and vehicles than ever. 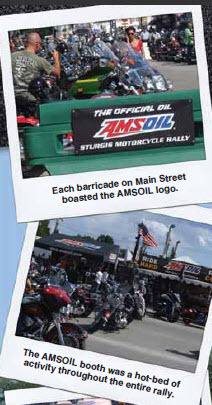 Representing AMSOIL was Director of Advertising Ed Newman. The first day of the show opened with the New Products Awards Breakfast. Over 2,000 new products were submitted for consideration of this distinctive honor in 15 different categories, and judges were looking for superiority of innovation, technical achievement, quality, consumer appeal and marketability in their search for the winners. 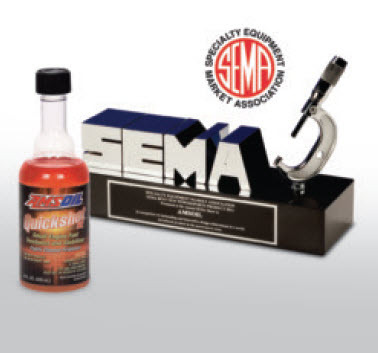 With Dave McClelland of Hot Rod TV and the Voice of SEMA leading the awards program, AMSOIL Quickshot SE was announced as the winner of the Best New Powersports Product Award. AMSOIL Quickshot SE (AQS) is formulated to thoroughly clean varnish, gums and insoluble debris in two- and four-stroke gasoline-powered small engines and powersports equipment fuel systems, restoring peak performance. It effectively addresses performance issues related to ethanol, water and dirty pump gas, and stabilizes fuel between uses and during short-term storage periods. AMSOIL Biodegradable Synthetic Hydraulic Oil has been selected as a 2011 World Ag Expo Top-10 New Product and is in the running for the 2011 World Ag Expo Attendees’ Choice Award. 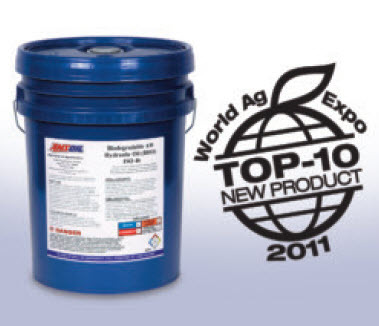 Visit www.worldagexpo.com/General-Info/Top-Ten/ Top-10-Products-2011.htm to vote for AMSOIL Biodegradable Synthetic Hydraulic Oil to win the 2011 World Ag Expo Attendees’ Choice New Product Award. As a World Ag Expo Top-10 New Product, Biodegradable Hydraulic Oil will be featured in the event’s New Product Center, as well as in a variety of publications, including the World Ag Expo Preview magazine, Official World Ag Expo Show Guide, the World Ag Expo Top-10 New Product Digest and the event’s website at www.worldagexpo.com. The World Ag Expo at the International Agri-Center in Tulare, Calif. represents the largest agriculture exposition in the world. Expected to draw approximately 100,000 attendees and feature 1,600 exhibitors displaying the latest agricultural products and technology, next year’s 44th annual event will be held February 8-10 and will offer a variety of seminars and demonstrations for dairy producers, farmers, ranchers and agri-business professionals. AMSOIL Biodegradable Synthetic Hydraulic Oil (BHO) is designed to provide premium hydraulic fluid performance for demanding applications, while effectively addressing biodegradability and low toxicity requirements. Its blend of high oleic oils, synthetic esters and customized additives not only protects hydraulic components against wear, but also protects the environment in the case of leakage or spills. New AMSOIL European Car Formula 5W-30 Synthetic Motor Oil (AEL) provides exceptional performance and protection for high-performance European vehicles manufactured by Volkswagen, Audi, Mercedes-Benz, BMW, Porsche and more. Owners of vehicles requiring an oil meeting the VW 504.00/507.00 specification are actively seeking appropriate products. As one of only a few oils available in North America that meets the VW 504.00/507.00 specification, Dealers are presented with an excellent opportunity to capture increased sales. The low-viscosity formulation maximizes fuel efficiency without compromising engine protection, while meeting strict European performance requirements for gasoline and direct-injection diesel engines designed for low-viscosity oils. Formulated with low sulfated ash, phosphorus and sulfur (SAPS), AMSOIL European Car Formula 5W-30 complies with modern emissions systems to provide optimum life and performance. Stay-in-Grade Performance Sophisticated European engines subject oil to severe operational conditions. Oils must demonstrate excellent high-temperature/ high-shear (HT/HS) performance to maintain viscosity and provide adequate engine protection. AMSOIL European Car Formula 5W-30 Synthetic Motor Oil is engineered to stay in grade despite rigorous operation throughout the extended drain intervals European automakers recommend. Formulated with a select additive package and shear-stable synthetic base oils, it meets strict ACEA and VW HT/HS requirements to provide outstanding wear protection and is recommended for the longest drain interval recommended by the manufacturer. Low SAPS Formulation Excessive sulfated ash, phosphorus and sulfur (SAPS) in motor oil can harm modern exhaust treatment devices. Diesel particulate filters (DPFs), for example, require low-SAPS motor oil to help prevent filter plugging. AMSOIL European Car Formula’s low-SAPS formulation promotes optimum emissions system performance and life, reducing maintenance costs. Maximum Fuel Economy AMSOIL European Car Formula is engineered with a 5W-30 viscosity and friction modifiers to reduce friction for increased energy through-put. It minimizes internal engine drag, providing an alternative for motorists currently using heavier grade oils, but who desire maximum fuel efficiency. Enhanced Turbocharger Protection Turbocharged Direct Injection (TDI) engines commonly used in European vehicles require thermally stable oils that resist deposit formation and provide adequate turbocharger cooling. Thermally stable oils help keep oil passages clean and promote fluid circulation so turbo bearings stay cool and lubricated. 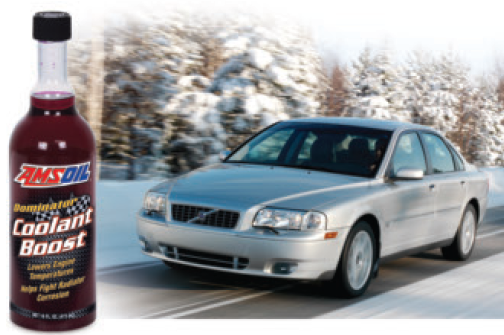 AMSOIL European Car Formula provides protection and performance for TDI systems in all temperature extremes. Its low pour point protects turbochargers against oil starvation and ensures rapid oil pressure in sub-zero conditions, while its thermal stability withstands high-temperature/high-RPM breakdown to resist deposit formations that starve TDI systems of lubrication. 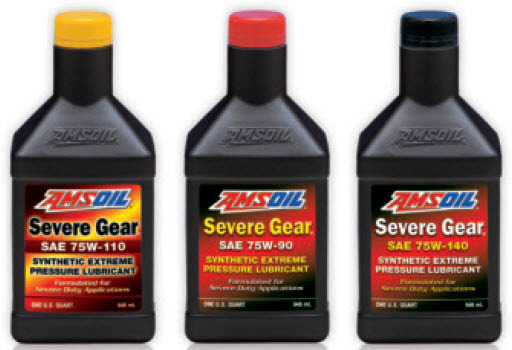 In 2007, AMSOIL subjected Severe Gear 75W-90 Synthetic Gear Lube and a number of competing gear lubes to a comprehensive series of industry-standard tests. While some lubes performed well in some areas and poorly in others, Severe Gear placed near the top in all performance categories. It revealed itself to be the most well-balanced formula for its time, capable of providing exceptional performance and protection in a range of applications. Since then, AMSOIL gear lube technology has advanced, making an already superior product stronger. 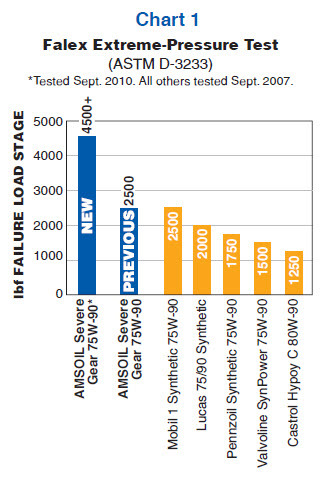 As the results show, the new additive technology allows Severe Gear to outperform the previous formulation and all of its competitors as tested in 2007. AMSOIL has raised the bar for gear lube performance even higher. High-horsepower/high-torque applications demand lubricants with increased extreme-pressure (EP) properties. The Falex Extreme-Pressure Test (ASTM D-3233) is used to determine a lube’s ability to provide EP protection. As Chart 1 shows, although the previous formulation ranked in the top tier, the new technology provides an 80 percent increase in EP protection and easily outperforms all competing formulations from A Study of Automotive Gear Oils. Severe applications such as towing, hauling and racing subject gear lubes to severe conditions, causing fluid film rupture in lesser lubricants. Metal-tometal contact can result, inviting rapid wear and, ultimately, gear failure. 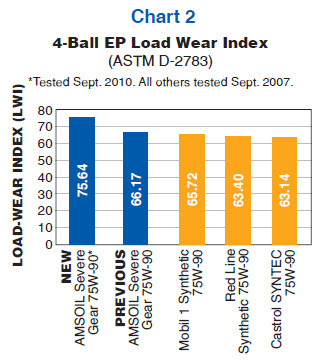 The 4-Ball Load Wear Index Test (ASTM D-2783) determines a gear lube’s anti-wear properties under heavy load. Higher values, reported as the Load Wear Index (LWI), indicate increased wear resistance. As demonstrated in Chart 2, the new formulation provides a 14 percent higher value than the previous formulation and ranks higher than all scores achieved in 2007 testing. The technology behind the entire line of Severe Gear Synthetic EP Gear Lubes also provides increased foam control, thermal and oxidative stability, limited-slip differential chatter suppression and torque retention. 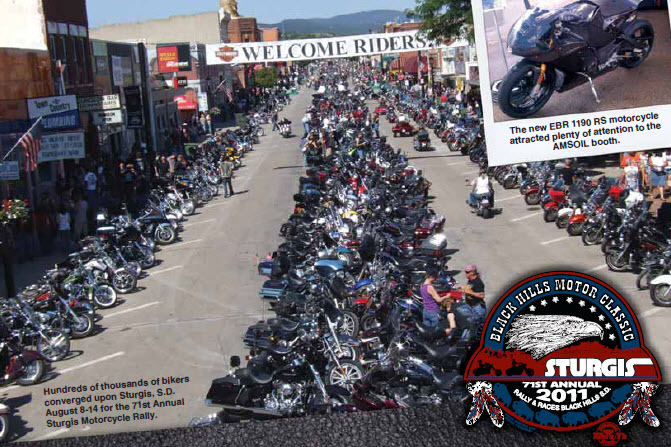 Recommended for Harley-Davidson and big-bore motorcycles that require a 60-weight oil. Superior synthetic formulation provides long service life and maximum protection against engine wear. Superior shear stability provides unsurpassed protection for high performance engines and transmissions. No friction modifiers. Wet clutch compatible. Recommended for Harley-Davidson, Buell, KTM, Ducati, Aprilia, BMW, Triumph and other motorcycle engines. Superior synthetic formulation provides long service life and maximum protection against engine wear. Superior shear stability provides unsurpassed protection for high performance engines, transmissions and primary chaincases. No friction modifiers. Wet clutch compatible. Recommended for Honda, Yamaha, Kawasaki, Victory, BMW and other motorcycle engines. Superior synthetic formulation provides long service life and maximum protection against engine wear. Superior shear stability provides unsurpassed protection for high performance engines and transmissions. No friction modifiers. Wet clutch compatible. Recommended for Honda, Yamaha, Suzuki and Kawasaki motorcycle and scooters, as well as Arctic Cat, Can-Am, Honda, Kawasaki and Suzuki ATVs and UTVs. Superior synthetic formulation provides long service life and maximum protection against engine wear. Superior shear stability delivers unsurpassed protection for high performance engines and transmissions. No friction modifiers. Wet clutch compatible.